The DAMM TetraFlex® Infrastructure system provides fast and resilient feature-rich digital TETRA radio communications. The system comes complete with indoor or outdoor base stations as well as integrated software functions and can easily expand as your requirements change. Whether you need a single-site or multi-site system, TetraFlex® provides plug and play simplicity for easy setup and fast deployment. When planning your network, you never need to worry about future capacity and coverage. With TetraFlex® you can scale your network at any time or upgrade your system to provide more capacity to meet increased communication demands. 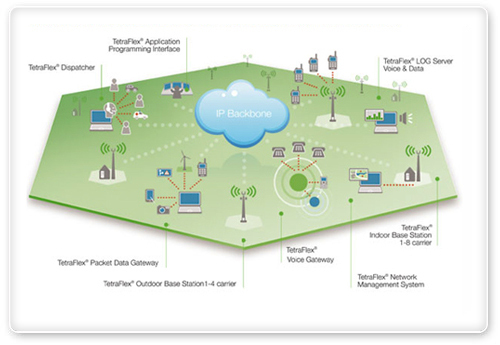 TetraFlex® is 100% based on IP technology and connects all network components including indoor and outdoor base stations, dispatchers, network management facilities and external gateways in one state-of-the-art intelligent distributed architecture. No central switch is needed. And together with the intelligent TetraFlex® software, it enables simple and self-configuring site expansion - even while TetraFlex® is in operation. TetraFlex® is the most user friendly TETRA infrastructure on the market, and comes with a long range of embedded software products with unique intuitive graphical interfaces. For more information on our products, please see below. Click here to view the DAMM TetraFlex® Product Feature Movie.